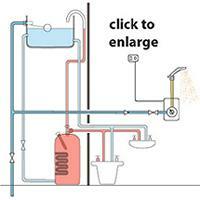 An Instantaneous Electric Shower typically provides a hot shower with water at mains pressure. The basic, mains fed installation is shown to the right. It is generally fairly easy to install an Instantaneous Electric Shower as it usually only requires a cold water feed from the rising main and a suitable electrical connection - note however that Part P of the Building Regulations apply and a suitably qualified electrician must normally connect the shower unit as it will usually be within a Zone 1 area. It heats the water as it is uses, so there is no limit to the number of showers which can be obtained - both the alternatives are limited by the size of the hot water tank. The pressure of the shower is less than the Power Shower but typically greater than the Gravity Feed Shower. Various Wattages are available on different models of Instantaneous Electric Showers (typically 6 to 11kW); with a larger wattage, the higher the temperature rise obtainable for a given flow of water. An Instantaneous Electric Shower heats the water as it passes through an electrical element within. The shower unit typically has a rotary control which sets the temperature of the shower water. Various protection circuits are inbuilt to ensure that the heater is only switched on when there is adequate water pressure, water flowing and that the water does not overheat etc. Any installation of an Instantaneous Electric Shower must conform with the local Water Company's bylaws. 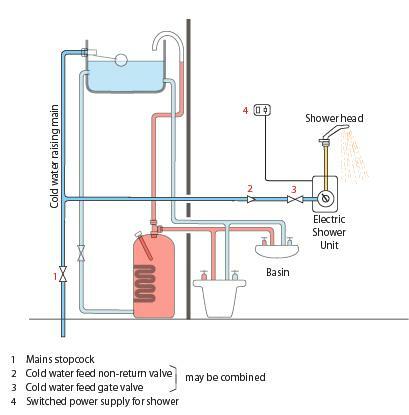 Check with the literature supplied with the shower but usually it will need to be connected to a mains water supply with a minimum running pressure of 1.0 bar (14.5 lbs per square inch) at a flow rate of 8 litres/minute and a maximum static running pressure of 10 bar (145 lbs per square inch). This is nothing special and providing you have good mains water pressure, you can probably be assured that your mains water supply meets this requirement. If in doubt, ask a local plumber or the Water Company. Alternatively, some Instantaneous Showers will work with a gravity feed from a cold water tank providing that there is sufficient 'head' (i.e. the vertical distance between the base of the tank and the sprayhead) - typically a minimum head of 10 metres (33 foot) will be required - but check the literature supplied. With such a gravity feed supply, the pipe from the tank should feed the shower only - for long pipe runs, 22mm pipe should be used for most of the run to reduce flow resistance. 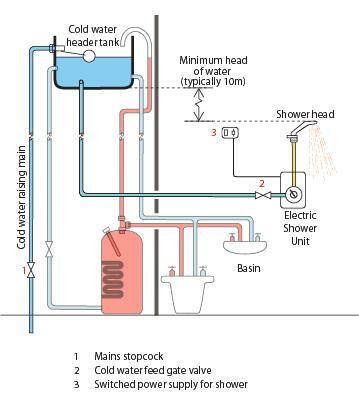 Where the water supply is taken from a rising main, the feed to the shower must include a non-return valve to prevent any water flowing back into the mains under fault condition - it is also a good idea to include an isolating valve just before the shower unit so that it can be isolated if necessary. Combined 'non-return valve' and 'isolating valves' are available. Often the water pipe feeding the shower can be hidden in the wall (often behind tiles). Leave connecting the pipe to the shower until all the other pipework has been completed and flushed through to clear any debris. Connect a hose to the shower end of the pipework before flushing through so that this water can be safely disposed of. As mentioned earlier, Part P of the Building regulations applies any any electrical installation must be carried out (or checked) by a suitably qualified electrician. Generally a separate permanently connected supply must be taken from the Consumer Unit to the shower via a double pole switch. The protection at the Consumer Unit, the double pole switch and the interconnecting cable must all be adequate for the current drawn by the Shower Unit. The switch can be a ceiling mounted pull cord type within the shower area or a wall mounted switch outside of the shower area. From personal experience, Instantaneous Electric Showers don't last all that long (8 to 10 years), by which time the design has moved on and 'improved'. Replacing the unit always seems the better idea than repairing but the sizes change (although the connections don't seem to), so consider mounting your shower unit on the face of the tiles rather than tiling up to the edge of the unit - then when you come to replace the unit, you won't need to remove tiles or fill in the gaps around it. Think about adding a limescale inhibitor device in the water feed line to your shower (after the mains non-return valve). After you shower, continue to run the water and turn the temperature setting to 'cold' to flush out any hot water from the heating element and shower head. Keep an eye of the flow through the shower head, if it seems to be becoming clogged, either buy a new shower head or, if the existing shower head can be dismantled, clean it - soaking in a 'kettle limescale cleaner' will remove any limescale build up. Try to obtain a spare 'Pressure Relief Valve' to keep for when needed; most well-known manufacturers will send out a couple to you free of charge if asked - they are generally easy to replace, but if you need a plumber, having the spare part will make it easier/quicker to repair.